Stretching along the south-western coast of South Africa, the Garden Route has a wealth of natural wonders, outdoor adventures and friendly folk. Jeremy Jowell went exploring. With a swing of his dreadlocks and a dazzling smile, Leo Block greets me with a true Rastafarian welcome. 'Irie, it's good to meet you, welcome to Judah Square,' he beams, extending his fist to touch mine in the Rasta gesture of friendship and peace.Nestling in the green foothills above Knysna, the House of Judah Rastafarian Community is one of the most serene spots in South Africa. Life here is tranquil, relaxed and easy-paced. 'I was one of the founding members when we started our community in 1993,' says Leo, 'and today over 100 Rastafarians live here. Our children go to school in the area but we also teach them privately about our Rasta ways. We are a closely knit community and we show each other love and respect, so its very peaceful here, give thanks. 'In recent years, tourism has been booming along the Garden Route with increasing numbers of local and foreign travellers. Many of them, however, want to do more than just take a hike or laze on a beach. They want to meet the local people, like Leo, and learn about their way of life. 'Visitors nowadays want to experience the local culture so we have been discussing ways forward with the tourism authorities,' says Leo. 'Already we have had large groups coming on township tours and we welcome them to meet us and see how we live. 'But for visitors to the Rasta community of Judah Square, there is a set of disciplinary rules that everyone is asked to adhere to. No cigarettes, alcohol, meat, skimpy clothing or bad language is allowed.Starting at Heidelberg, the Garden Route stretches eastwards along the southern Cape coast, past Plettenberg Bay and the Tsitsikamma National Park, to its boundary at Humansdorp. With golden beaches, indigenous forests and tranquil lagoons, this coastline of beauty is blessed with a multitude of natural wonders and diverse outdoor activities.Often referred to as 'the jewel of the Garden Route', Plettenberg Bay offers residents and visitors a life of languid pleasure. For those who prefer action, there is everything, from hiking and biking to sea kayaking and scuba diving, in and around Plettenberg Bay.Try a dolphin cruise from Central Beach for close-up encounters with whales, seals, dolphins and even Great White sharks. Or take a hike around Robberg Peninsula and explore archaeological caves. There's also the worlds highest bungy jump, mountain biking in Harkerville Forest and a primate sanctuary to visit. Golf enthusiasts are well catered for with several world-class courses in the area, including Fancourt, venue for the recent Presidents Cup.Apart from stylish Plettenberg Bay, the other major town along this coast is Knysna, recently nominated as the top town in South Africa. 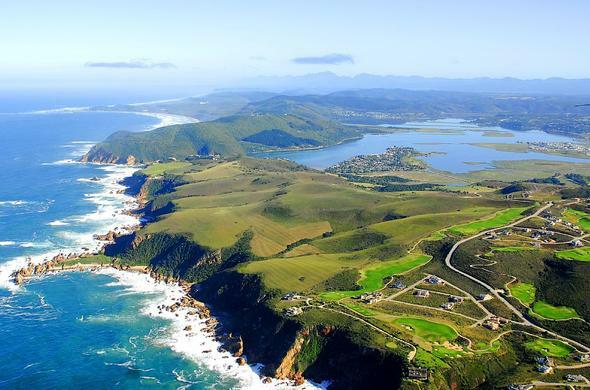 Once a sleepy village known only for oysters, elephants and stinkwood, Knysna has developed into a bustling modern town with upmarket hotels, busy shopping centres, colourful flea markets and luxury island housing estates.The best way to explore the scenic secrets of the Garden Route is with a flexible itinerary and time on your side. Driving from Cape Town, most visitors travel along the N2 highway towards Knysna.Today I'm taking an alternative route and head inland along the scenic R62, passing through the lush vineyards of the western Cape. I'm in no rush to get to Plettenberg Bay, so I take a detour to Oudtshoorn, known for its ostriches and the world-famous Cango Caves. Finally, with the sun softly burning the landscape, I drive down a dusty road via Avontuur and the Prince Alfreds Pass to the coast.Although I've visited the Garden Route many times, I've never done the short hike from Natures Valley to Salt River Mouth. This is one of the lesser-known hikes in the area and reputedly an easy ramble to a secluded paradise.I set off down to the end of the beach where a footpath continues along the coast, passing crystal clear pools and jagged black rocks. Up a hill and through a dense patch of forest, then the trail descends to the tranquil bay at Salt River mouth.I walk far out in knee-deep water and am surrounded by the rugged beauty of forest-fringed cliffs. The afternoon sun beats down and the beach is deserted, the perfect place for a skinny dip swim.I soon get absorbed in photographing the small beauties of nature, like the golden patterns of pebbles in the clear brown river. Or the shadows and shapes on the water when it's lightly ruffled by a breeze. Time flies and a few hours flash by in an aqua haze of heat. By the time I get back, it's sunset.One of my annual Garden Route rituals is a bicycle ride in Harkerville Forest. The reputation of the three Harkerville trails, with their stunning single track and sweeping views over the Indian Ocean, is legendary among mountain bikers throughout the country.It's a perfect afternoon as we cycle out along the single track, then fly down a rocky path, ramping over roots and sliding around stony corners. Cycling in Harkerville is like riding through an enchanted fairyland. In some places the foliage overhead is so thick that only occasionally does dappled sunlight filter through, illuminating us in a soft green light.We click the gears and pedal over pine needle paths. The earthy smell of the forest is invigorating and I breathe in deeply of the fresh forest air. 'This place is incredible,' says one of my fellow riders who has never cycled here before. 'I've done a lot of offroad routes all over South Africa but none of them have been quite as beautiful as this. 'A journey through the Garden Route is incomplete without a visit to Storms River Mouth in Tsitsikamma National Park. This is the starting point of South Africa's most famous hike, the Otter Trail.After a morning spent snorkelling and walking along the coast to a waterfall, I stop at the Bloukrans Bridge to watch terrified tourists leap off the world's highest bungy jump.A short distance away is Monkeyland, a primate sanctuary for orphaned and abused monkeys, which is well worth a visit. An informative guide leads me though the forest, pointing out the many species of primates, including capuchins, squirrel monkeys, gibbons, tamarins and lemurs from Madagascar.With so many beautiful beaches along the Garden Route coast, to visit them all would take weeks. Two of the best are Keurbooms Beach, where you can walk for miles without seeing a soul, and Brenton-on-Sea with long expanses of virgin white sand.But top of the beach list is undoubtedly The Island on Robberg Peninsula. There's no vehicle access and it's a 30-minute hike to this long sandy spit sandwiched between two horseshoe bays.It's my last afternoon and I walk down the deserted beach before climbing to the rocky cliffs that are home to a teeming community of seagulls. The circular path continues past the squawking birds nesting on the windswept promontory. Way down below, huge waves crash onto the jagged rocks. The setting sun momentarily breaks through purple storm clouds to illuminate a pod of silhouetted dolphins as they leap and surf just beyond the breakers. This is the golden glory of the Garden Route.Copyright © 2004 Jeremy Jowell. All rights reserved. Reproduction in whole or in part without the permission of the author is prohibited.